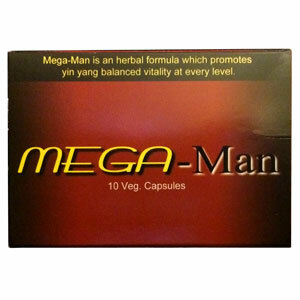 Mega Man is a non-prescription herbal vitality formula which promotes a harmonious Yin and Yang energy flow inside the male reproductive system. Take one capsule 90 minutes before intimacy and it will support the Yin-Yang balance for sexual performance. For better results, take Mega Man either 2 hours before or 2 hours after taking other supplements or medications. Consult a physician if you have any heart problems. Do not use if you have high blood pressure, fever, heat signs and symptoms (flushed, red face, dry mouth or throat, thirst, etc). Stop using immediately if undesirable effects develop. Keep out of reach of children.